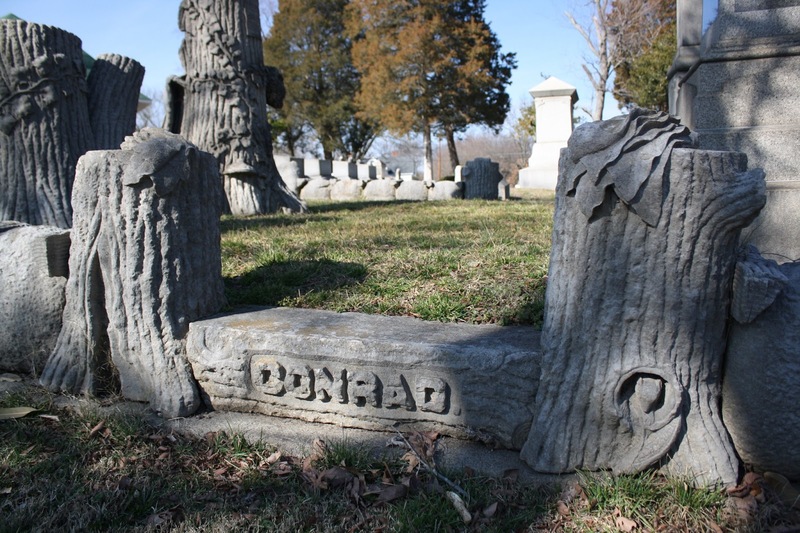 I’ve made it no secret that the Conrad-Holland square in Green Hill is one of my favorite family plots of all the cemeteries that I’ve visited. A great deal of detail went into the tree and rock themed markers, borders, and decorative accents. The people buried here have been the subjects of several “investigations” on this site, even though most of the descendants are long gone from the Danville area. 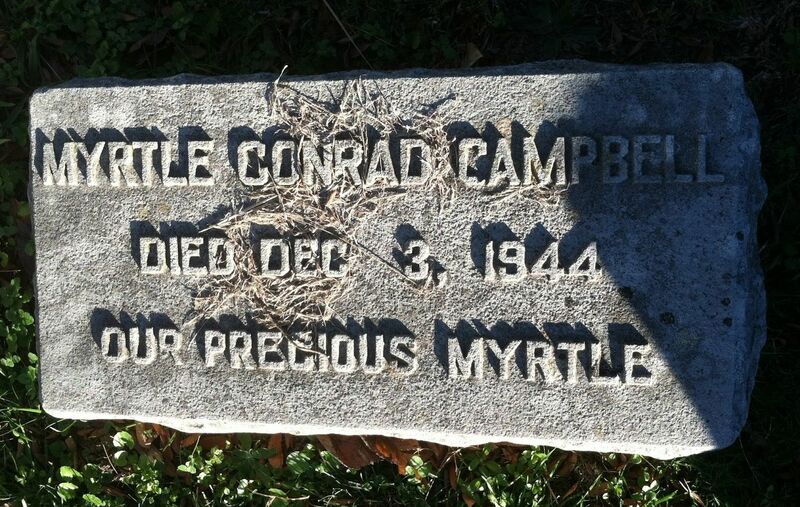 If you were looking at the square from the first photo, Myrtle Conrad Campbell’s flat grass marker would be behind the large tree monument belonging to her mother, Mary Parker Holland Conrad. Myrtle St. Clair Conrad was born on July 24, 1886. She was only 3 when her mother died and about 7 when her father passed away. She and her siblings lived with her maternal uncle and his wife following Charles Conrad’s death. 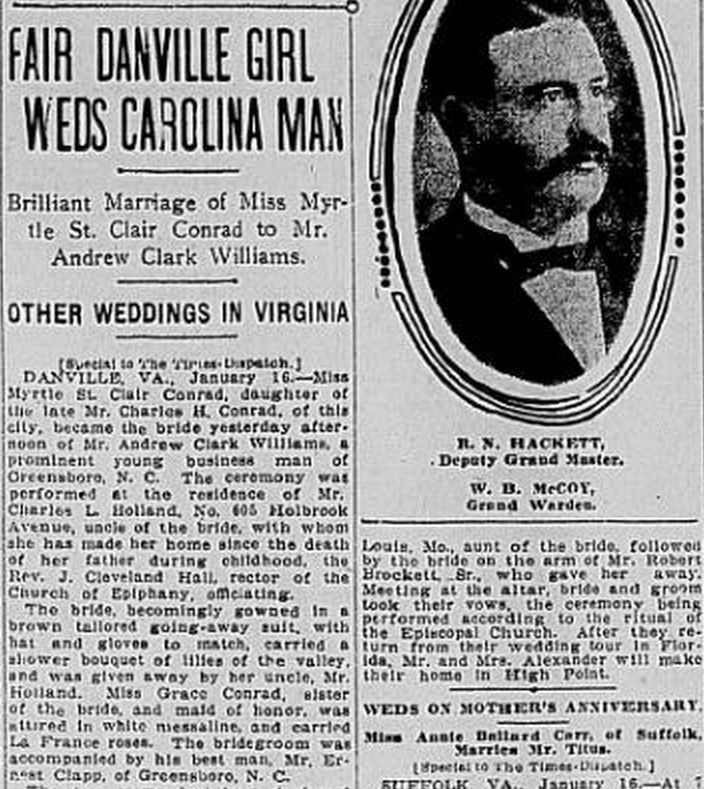 Over the years, Myrtle’s name is found in the Society pages of Virginia’s newspapers, attending dances, visiting other well-to-do people, attending in weddings, etc. 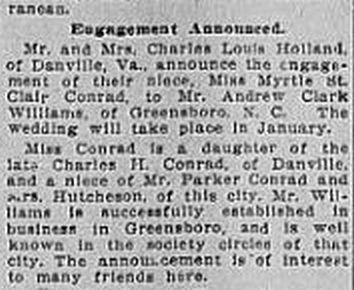 Late in December 1907 her engagement to Andrew Clark Williams of Greensboro was announced, with the wedding to follow in January. 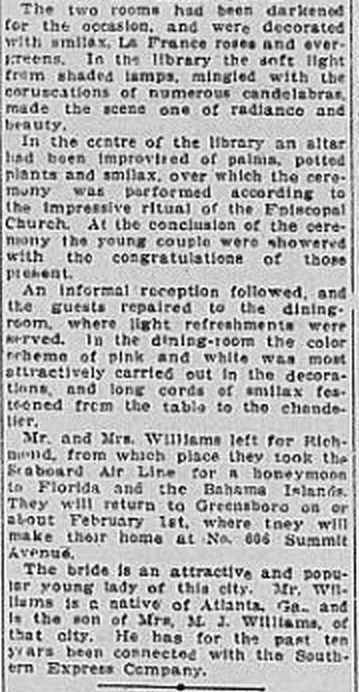 The ceremony was held at her uncle’s house and described in some detail in the article “Fair Danville Girl Weds Carolina Man.” After the honeymoon in Florida and the Bahamas, Myrtle and Andrew were supposed to live on Summit Avenue in Greensboro. 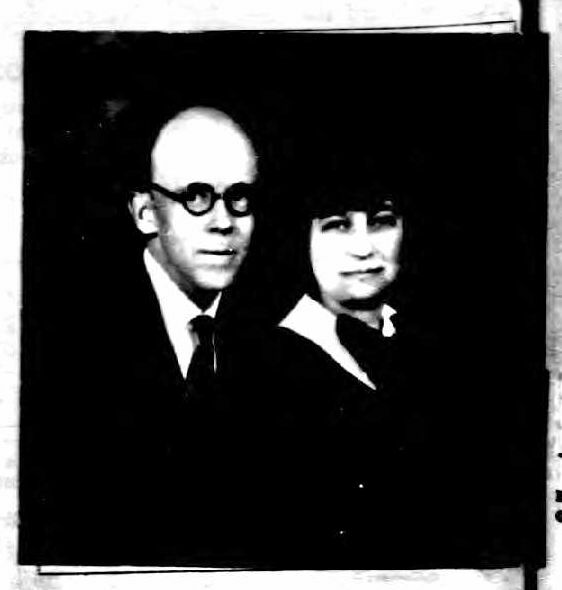 In 1910, Myrtle and Andrew were living in Danville in the same residence as her sister Lois and her husband William “Hunt” Wimbush on West Main Street. Andrew was recorded as a “boarder,” oddly enough, and employed as a clerk at a railway company. By the time of the 1920 Census, Myrtle was living with and Hunt at 116 Broad Street in Danville. Divorced from Andrew, she was a stenographer at a doctor’s office. When or why the marriage ended, I don’t know. While divorce is sadly a fairly common occurrence today, it wasn’t that commonplace in the early 1900s. 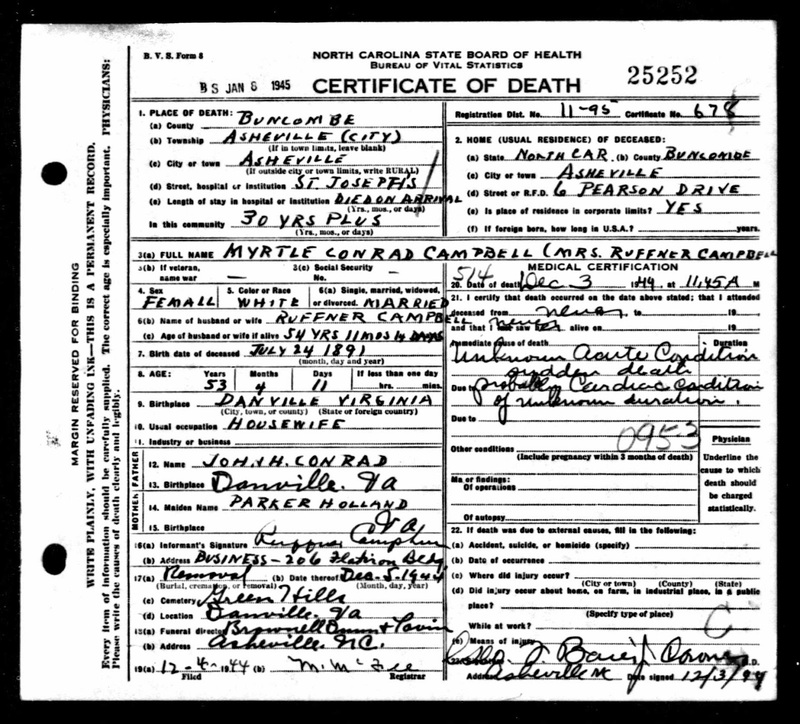 If the information on a 1924 passport application was correct, Myrtle married lawyer Ruffner Campbell on Jan. 6, 1921. In 1930, Myrtle and Ruffner were living at 44 Kimberly Avenue with an infant son Ruffner, Jr., and a “servant” named William Foggie. Their Grove Park district house, built in 1928, was near the Grove Park Inn, a resort that opened in 1913 and has been visited throughout the years by Presidents and many other public figures. F. Scott Fitzgerald spent an interesting two years at the Grove Park Inn beginning in 1935. I wonder if Myrtle ever bumped into Fitzgerald or any of the other prominent Inn patrons, living so close to the resort. 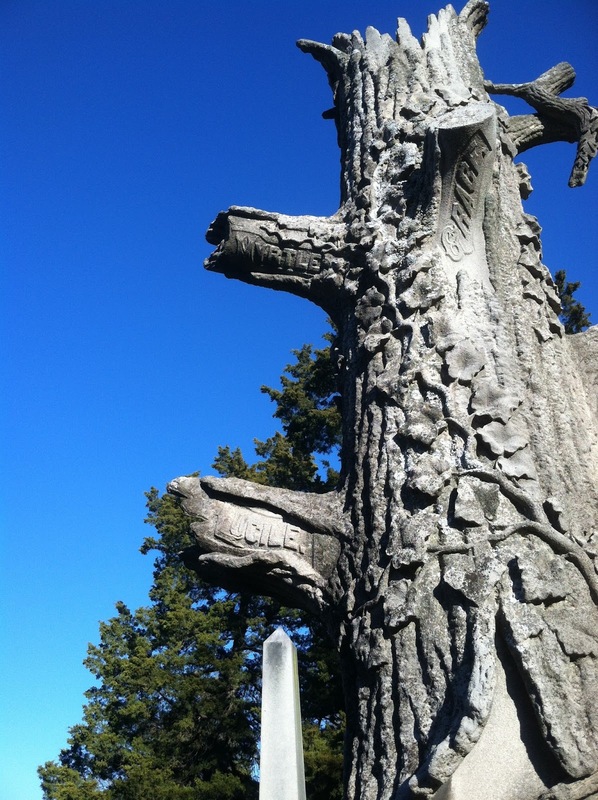 When Ruffner died in 1960, he was buried in Riverside Cemetery in Asheville, not alongside Myrtle in Green Hill. What an amazing monument and an equally fascinating story behind it. I do wonder what caused Myrtle's death. It was probably a heart attack (of some sort). 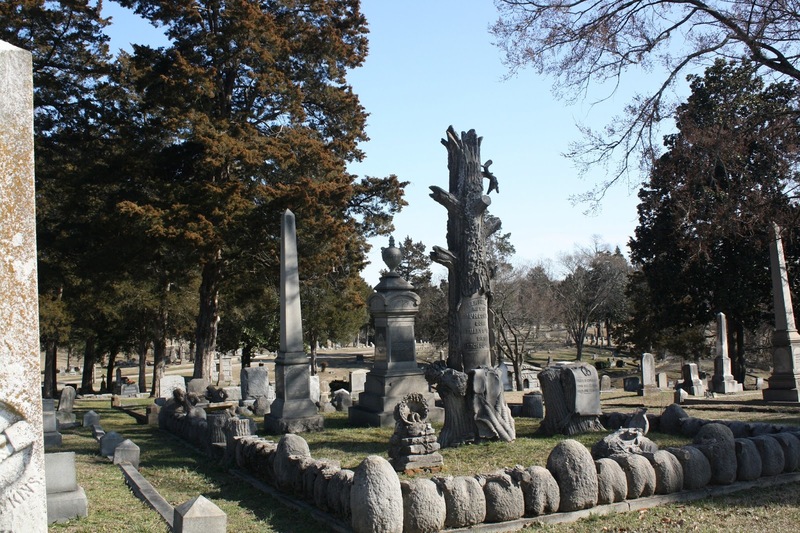 Another sister is buried in a nearby cemetery, but I haven't been able to find her grave yet. I have a photo of that sister from an old newspaper. I wish there had been an image of Myrtle when she was younger in the old papers too. Great story and pictures. Thank you! The Society pages have been a great resource, yet I remember reading them when they were still in the newspapers and thinking “what drivel”. There's a paper around here that's mostly full of details similar to the Society pages. I've often thought they were ridiculous, but future generations will probably enjoy finding out these types of details.